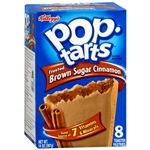 Kellogg's Pop-Tarts Frosted Cherry toaster pastries 14.7oz 416g - 8 Toasters The yumminess comes from the cherry-flavored filling. And the sweet, pink frosting. And the sparkly, red sprinkles. Oh, who are we kidding? It's good all over. Pop Tarts In the U.K. KELLOGG'S POP-TARTS are fully baked and ready-to-eat right from the pouch. If you prefer them warmed, please follow these instructions. Toasting appliance and microwave capabilities differ by manufacturer. Follow the manufacturer's guidelines for safe use. Be sure your appliance is clean and functioning correctly. Children should always be closely supervised when operating toasting appliances and microwaves. Enriched Flour (Wheat Flour, Niacinamide, Reduced Iron, Thiamin Monoitrate [Vitamin B1], Riboflavin [Vitamin B2], Folic Acid), Corn Syrup, High Fructose Corn Syrup, Dextrose, Vegetable Oil (Soybean, Cottonseed, And Hydroenated Cottonseed Oil With Tbhq And Citric Acid For Freshness)+, Sugar, Cracker Meal, Contains Two Percent Or Less Of Wheat Starch, Salt, Dried Cherries, Dried Apples, Cornstarch, Leavening (Baking Soda, Sodium Acid Pyrophosphate, Monocalcium Phosphate), Citirc Acid, Modified Wheat Starch, Gelatin, Caramel Color, Xanthan Gum, Soy Lecithin, Red #40 Lake, Red #40, Niacinamide, Reduced Iron, Natural Flavor, Yellow #6, Vitamin A Palmitate, Carnauba Wax, Pyridoxine Hydrochloride (Vitamin B6), Riboflavin (Vitamin B2), Thiamin Hydrochloride (Vitamin B1), Confectioner's Glaze, Folic Acid, Blue #1. 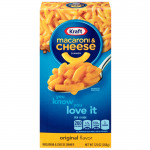 +Less Than 0.5G Trans Fat Per Serving.